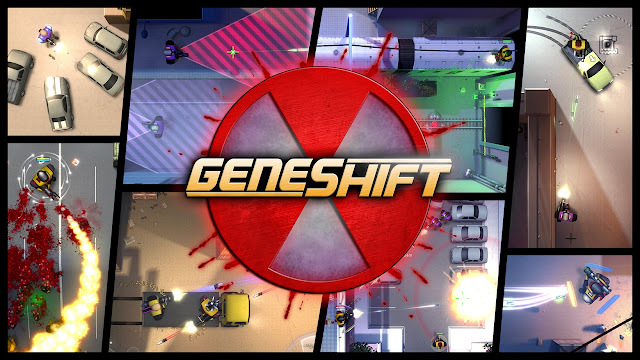 Coming from Nik Nak Studios Geneshift is a top down shooter that was released on Steam Early Access on May 23rd this year. Its at first simple looking graphics belies the fact that this is a shooter that just becomes more and more addictive the longer you play. 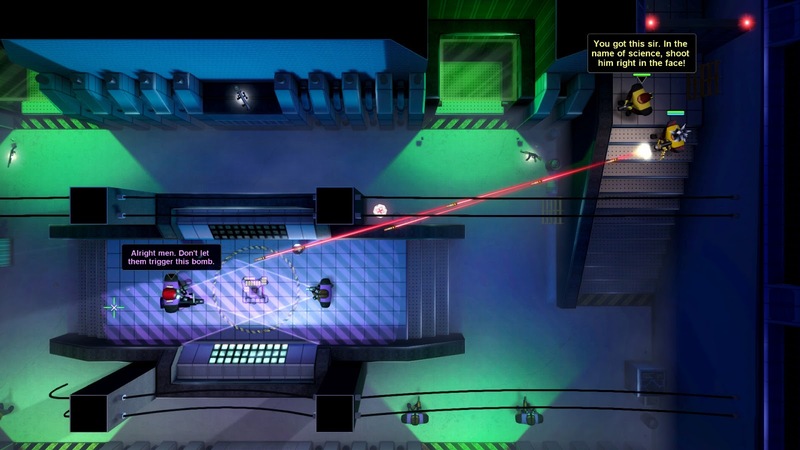 The game features 5v5 multiplayer combat, user generated maps, as well as a campaign that is playable with up to four friends. For this review I only played the campaign, and in single player as the other modes didn't appeal to me. The writing in Geneshift is fantastic, as you work around the ten levels that make up the campaign you partner, fellow friendlies, and the rebels all talk via speech bubbles that appear as text on screen. The dialogue is really silly but also really charming and funny. Your side frequently extolling the greatness of science, while the enemy have fun conversations with prisoners and each other. The humour is just so on point, I couldn't help but fall in love with the charm shown here. A late example is someone telling you they can't help you battle the enemy as they hurt their back carrying some test tubes. These little conversations all feed into the plot which is basic enough but then gets some pretty cool plot twists and surprises. The whole story takes place in game and reminded me a bit of earlier PC Newgrounds style games in terms of the mood, the comedy is just so irreverent. 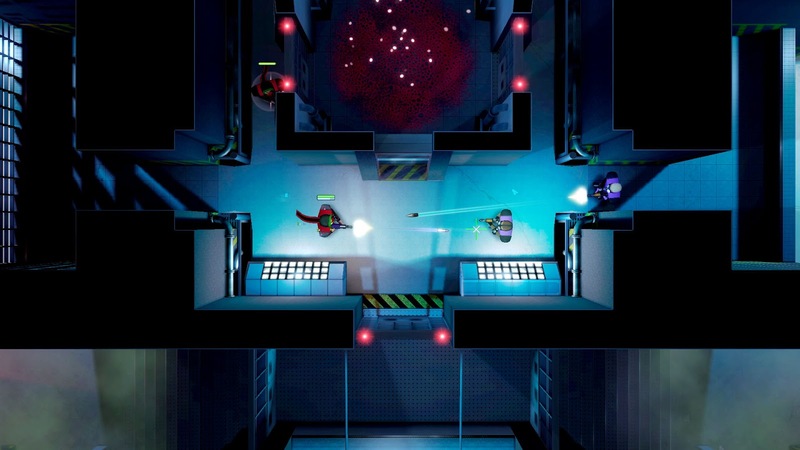 There was a strong nostalgic vibe for me playing this, in part this feels like Hotline Miami, but much slowed down with a reduced enemy count, the graphics meanwhile are full of nice lighting effects but brought to mind the feeling of playing Amiga games back in the day which is no bad thing. You walk around with the keyboard, use the mouse to aim your guns and shoot, and activate your special abilities with a right click. Each level takes place in a different location and at first glance seems small. However it is clever how these levels are designed with you winding your way around corridors, up staircases and looping back on yourself, they do not feel short, or too long, they are a nice decent length. The levels range from city streets to sewers, research facilities and docks and while that doesn't sound too thrilling I really come to love the little details these places had. Each level is full of check points so you are never far away when you restart, plus you have infinite lives and dead enemies remain dead. Rather than that make Geneshift boring it actually appealed to me as I loved the relaxed state of play I had on standard difficulty. It is a nice change for a game to just be plain fun rather than frustrating. There are over twenty different weapons to collect and use, these include a wide assortment of shotguns, machine guns and rifles. Each checkpoint also operates as a shop where you can buy ammo and weapons. You also have access to mutant abilities which are really quite varied. From more normal ones such as a healing circle, invisibility and poison shots to more awesome ones like a nuclear damage of effect are around you, and my favourite; a bunch of rotating blades around you that after a set point can fly out and kill everyone around you. There are also cars in some of the levels, these don't really serve much of a purpose but the controls are decent enough and they make for a nice and brief change of pace. Throughout you get some appropriate music that while never outstanding is never dull, it fits the whole style of the game well and again just felt so strangely nostalgic. Gun shots sound effects are all good enough, I guess for me I wish that there had been more sound effects, well in particular I wish the zombies had made noise rather than be silent. The majority of the enemy type you face are other humans, they are armed with a variety of weapons, and they also have mutant abilities the same as you do. Most levels culminate in a boss of some kind against a larger human aggressor, these always have great final comments before they die such as one who (to paraphrase) goes 'God of Science, I come to thee!'. 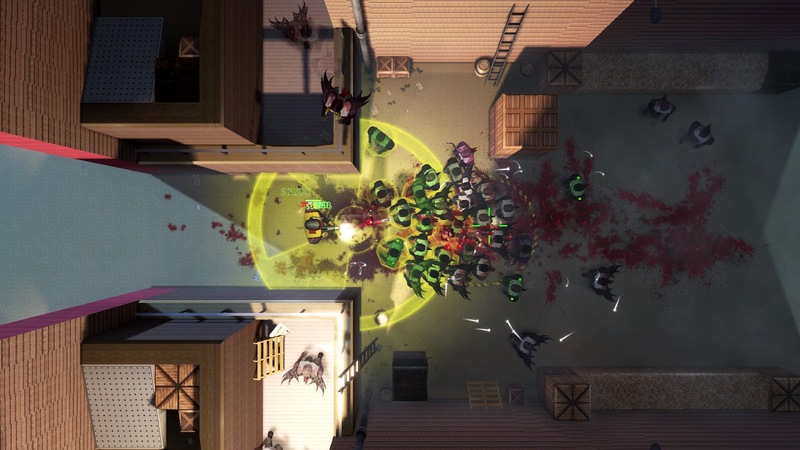 I was initially disappointed that there are not many zombies in the game, this is very much a shooter where you have to line up your shots to take out people shooting back at you. Zombies only appear at set points, a couple of times per level where you must power up a bomb by killing approaching hordes of undead assaulting you from all sides. This is mixed up later in the game with your character being pinned in place when they attack. I had a lot of fun over the course of this roughly four hour game, the more I played the more I came to really appreciate the great writing, and the fun experience of playing this. I don't play too many PC games, much more of a console gamer, but with ones like this out there I wonder if maybe I should play more. Check out the trailer below.